From connecting with old college professors to finding new job opportunities, LinkedIn is the ultimate social network for professionals. But few users are aware of the power of LinkedIn outside its online platform. LinkedIn, like other social media networks, allows users to download data that is specific to their profile. This includes everything from likes and connections to ad clicks and targeting criteria. While most of the data is just fun to observe, other data can provide deeper insight about your profile. In this article, I’ll show you how to export your LinkedIn data, what this data consists of, and what to do with it. 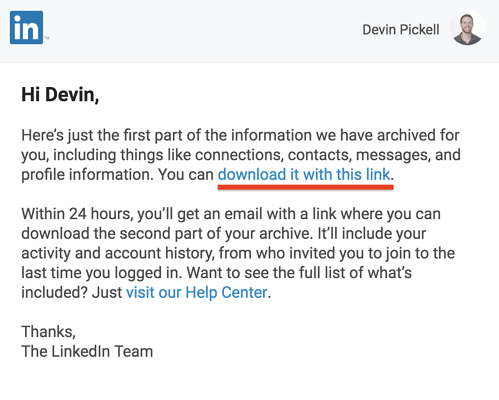 It’s a bit of a lengthy process downloading your LinkedIn data. This is mostly because LinkedIn has to acquire all the information you’ve requested from your profile and then compile it in .csv format. At the top of your homepage, find the tab “Me” below your profile picture. You’ll receive two emails to export LinkedIn contacts. One for a basic archive and one for an advanced archive. Open the email, click on the download link, and download your archive. For the visual learners, below is a step-by-step walk-through of exporting your LinkedIn contacts. Near the top of your LinkedIn homepage is a bar with multiple tabs. Find the tab that says “Me.” This tab will have your profile picture above it. 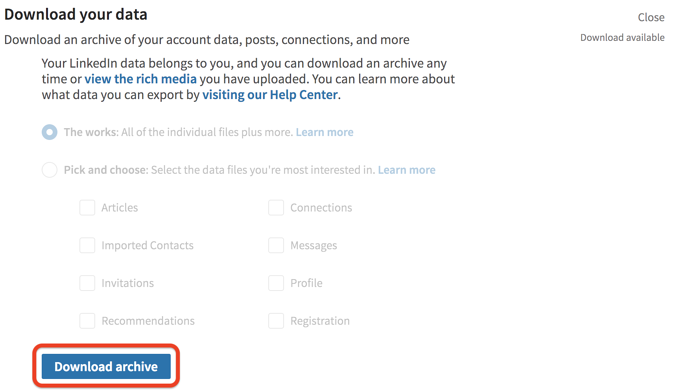 You should now be under a tab that says “Download your data.” From here, select which data files you’d like to extract, then click on “Request archive." Navigate to the primary email address that’s connected to your LinkedIn account. This is where the download link to your data archives will be sent. If you downloaded “the works” as I did, you should expect two emails to come through. The first email is a basic archive of data which should be available to download after 10 minutes, the second email is an advanced archive which should be available after 24 hours. I’ll get into the differences of each archive in a bit. 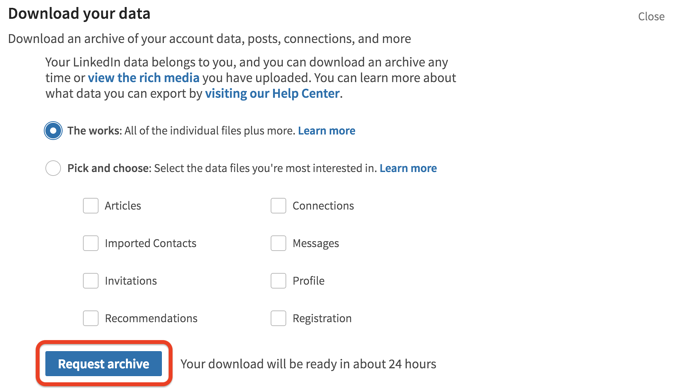 The final step involves downloading your data archive. Click the download link in your email and the .csv files will be stored on your computer. Tip: If you don’t have a way to access .csv files, check out our best other office software category with options to convert the files. Below is how a basic data archive will look when stored on your computer. At the time of writing this, I was still awaiting my advanced data archive. 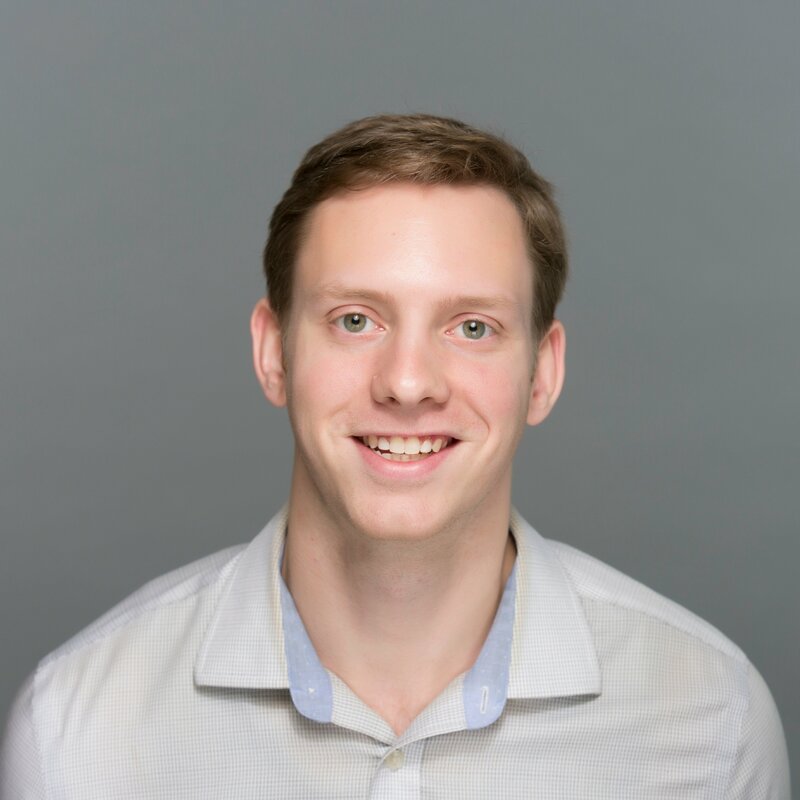 What’s in the LinkedIn data archives? There’s a variety of information in the basic and advanced data archives. Below is a table breaking down each data file and what information to expect. Data type What's in it? Causes you care about A compilation of causes you follow. Certifications Any professional certifications you’ve listed on your profile. Connections (1st degree) A list of all your connections along with email addresses if they’ve consented to share that information. Courses Any courses you’ve taken and listed on your profile. Education All records of education you’ve listed on your profile. This includes schools, dates attended, degrees you’ve earned, and extracurricular activities. Endorsements All records of given and received LinkedIn endorsements. This will also show any endorsements you’ve hidden. Honors Any honors you’ve received and its date. Inbox All sent, received, and archived messages. This includes message date, context, subject lines, and sender. Interests Any interests you’ve listed on your profile. Languages Any languages you’ve listed on your profile, plus your proficiency in those languages. Notes and Tags Any notes or tags about leads and accounts on your LinkedIn. Organizations All professional organizations you’ve listed on your profile. This includes dates, your position, and your role within the organization. Patents All patents you hold will be listed here. This includes patent date, type, and filing number. Phone numbers A list of your connections’ phone numbers if they’ve consented to share that information. Profile information Basic biographical information about your LinkedIn profile, such as first name, last name, and account creation date. Projects All projects you’ve listed on your profile will be found here, along with the project specifics. Publications Any publication you’ve been listed on LinkedIn will appear here. Receipts All LinkedIn transactions related to your profile will be listed here. Recommendations (given and received) Data about all given and received recommendations, as well as data, sender/receiver, and message context. Skills Any professional skills you’ve listed on your profile. Account status (history) All created, closed, deactivated, and reopened account information will appear here. Ads you’ve clicked A list of all ads you’ve engaged with. Ad targeting criteria All ad targeting information will be shown here. Comments All comments you’ve made on LinkedIn. This includes date, context, the item commented on, shares, and more. Email addresses All primary and secondary email addresses associated with your account. Follows Entities you follow on LinkedIn, such as users and companies. Group comments Comments posted in groups plus their dates. Also, a URL to the piece of content. Group likes Comments posted in groups and who liked them. Also, a URL to the piece of content. Group posts Posts started in groups, the date, context, group members, and a URL to the piece of content. Invitations A complete history of sent and received LinkedIn invitations. Likes A complete history of likes, except in groups. Login attempts A complete history of login attempts, login times, IP address associated with the login, and login type. This also includes third-party logins, for example, when posting something from Twitter onto LinkedIn. Mobile apps All LinkedIn mobile apps that are registered with your account, plus the registration date. Name information Any changes in your LinkedIn account name will be listed here. Photos All photos you’ve shared on LinkedIn will be archived here. Registration The date you registered for LinkedIn, the IP address you registered from, any members who invited you, and subscription type (basic or Premium). Search history A list of recent searches conducted on LinkedIn. Security challenges A log of unfamiliar activity on LinkedIn. Any prompts for two-factor authentication, Captcha, Pins, security questions, or other ways to confirm identity. This will also include the geographical location of the login and IP addresses. Shares All shares and re-shares that have occurred on your account will appear here. Whew, that’s a lot of information about your LinkedIn account, but what exactly do you do with this data after extracting it? Basic archives mostly reveal account activity, whereas advanced archives reveal account history. So, it could be neat to gain insight into how your profile has progressed since first signing up for LinkedIn. Data files like ad clicks and ad targeting could provide insight into how your profile is viewed by marketers on LinkedIn. For example, ad history based on your seniority level within a company. Another thing to look for in this data is security issues that have previously occurred on your account. If you don’t monitor emails from LinkedIn, this could provide great insight into previous login attempts, which type of login, its location, and its date. If connections have consented to have their email addresses and phone numbers accessible via data extraction, you can acquire this information and log it in your CRM or email marketing software. Of course, do this with contacts you actually know or have engaged with previously. By all means, don’t spam these users. Tip: Read our article on 2019 cybersecurity trends to be better prepared for GDPR compliance of the future. 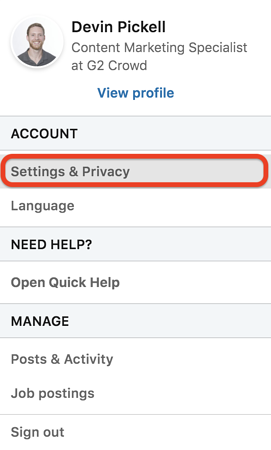 Whether you’re just curious about your account history or digging for deeper insight, it’s refreshing to see social networks allow users to download and take control of their data. New to LinkedIn? Learn how to change your LinkedIn URL so your account can be found easier on the platform. This also adds a bit of personalization. You can also easily upload your resume to LinkedIn and endorse a skill that a connection has posted.